Meet the crew of CLASSHIP I. 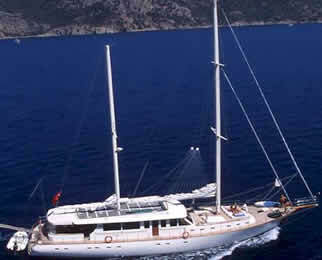 While cruising Turkey and Greek islands with Clasship I, soon you will realize that your appetite has been improved. Is time to enjoy the delicious Turkish dishes served on board. Turkish cuisine is among the world's most renowned. Our Turkish chef prepares for your enjoyment delicious Mediterranean meals with the most fresh vegetables and fish of the season. In his hands, food becomes a celebration and an art. 220V / 24V / 12V - 7000 lt. fresh water and 6000 lt. waste water capacity – 6000 lt. fuel capacity - 117 gallons (470 lt) main fridge and freezer and 18 gallons (72 lt) bar fridge - Electric toilets - Washing machine - 2 deck showers - Barbeque – Jacuzzi on upper deck - Tender Zodiac / 14ft 6in (4m) / with outboard Yamaha engine 40 HP - Water-skis - Windsurf - 4 sets of Diving equipment - Snorkelling and fishing equipment / TV PAL/SECAM - Stereo and CD/DVD players – Wide CD/DVD Libraries - Games - English library. New MCA (Marine Coastguard Agency) certified code 2 world wide charter licence (considered by many to be the most stringent in the world) with over 120 safety improvements. New extended teak upper deck providing a large private area for sun bathing with bimini covers for shade. New four people heated Jacuzzi with spar and Jacuzzi jets, heated hot water storage tanks and built in hi-fi speakers. New upper helm position with duplication of instruments. New MCA approved safety guard rails. Extended main aft deck roof with extra speakers and mood lighting. mproved access to upper deck and new ladder. New modern wrap around windows to main deck. Alcantara interior to saloon and bridge, wide flat screen TV, DVD, VCD, CD and 5.1 cinema surround sound. There is a comprehensive library of DVD's and CD's and second Hi-Fi. New redesigned larger fully stocked American bar with dedicated fitted drinks refrigerators and commercial ice maker. New champagne Connelly hide leather to all seating areas including Master and VIP cabins. New tiles, work surfaces, microwave and MCA approved safety gas hob in galley. New shower doors with easy clean safety glass to all cabins. New tiles and counter tops to all bathrooms. Installation of automatic fire detection and Co 2 fire fighting system. Smoke detectors in all areas. Bow thruster on the boat. Inmarsat satellite communication system and automatic E.P.I.R.B. (Electronic Position Indicating Radio Beacon). Installation of new running rigging greatly enhancing the sailing capabilities and performance. The Captain and First officer are two highly qualified RYA Yacht Master Instructors and will genuinely be to pleased to offer opportunities and instruction to those who wish to sail Clasship 1. Those prices include vessel, crew, and cruising fuel. Fuel for an average of 4 hrs cruising per day, crew wages, cooking service, Turkish harbor fees and taxes, Turkish transit log and yacht's insurance are included in the charter fee. Private marina fees, land tours, transfers and Turkish VAT (%18), where applicable, are extra. Clasship I has maximum 12 passenger capacity and the prices are set per day in Euros. When the option is confirmed, 40% deposit is required for booking. Balance to be paid before the departure for cruise. Please note that all trips are based on EMT terms with the list above. Optional additional trips and programs to Greek islands such as Rhodes, Kos etc. can be arranged if we are informed in advance. Disclaimer: This document is not contractual. All specifications are given in good faith and offered for informational purposes only. The publisher and company do not warrant or assume any legal liability or responsibility for the accuracy, completeness, or usefulness of any information and/or images displayed. Yacht inventory, specifications and charter prices are subject to change without prior notice. None of the text and/or images used in this brochure may be reproduced without written consent from the publisher.